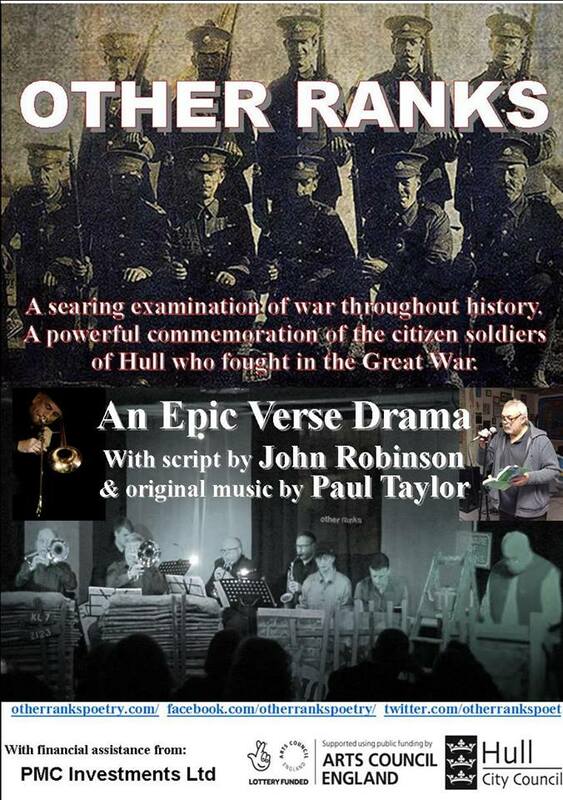 On Wednesday 14th November the final scheduled performance of Other Ranks will be staged at Hull Truck Theatre as part of Hull Jazz Festival. I am lucky to have been asked to provide original music for this remarkable piece of poetical writing by John Robinson. If you can be there, don’t miss the opportunity. As usual, I am extremely pleased to be presenting work again in Hull, a city that has been dear to my heart ever since I had the good fortune to study philosophy and psychology at the University of Hull many years ago. 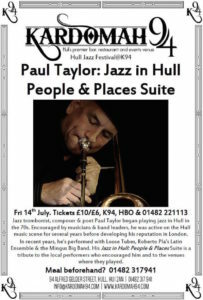 It was in Hull that I started to play jazz, and I remain ever grateful to the local musicians that helped me along. Another huge debt of gratitude is owed to my friend and fellow-schemer, Dave Ellis, who has enabled me to offer something back to Hull in several ways over the last decade. 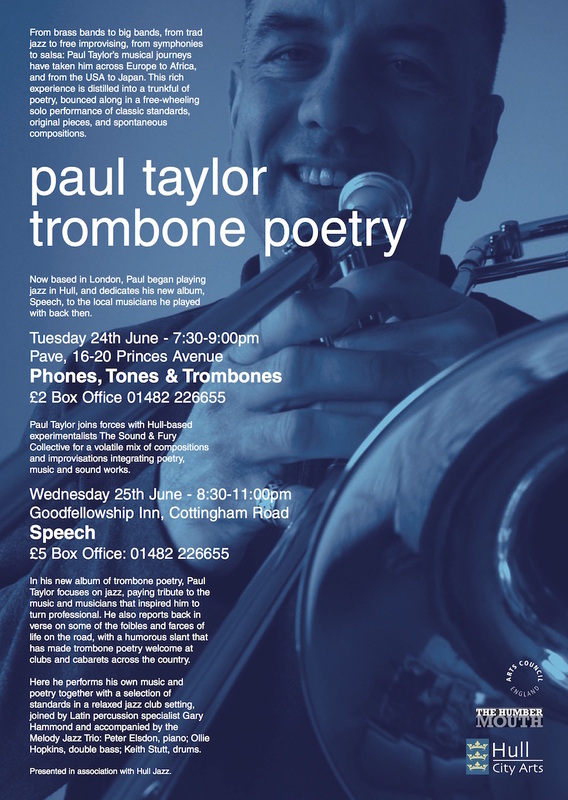 Dave has co-created, planned, managed and produced a series of events that have been of immense value to me and the trombone poetry project in particular. That’s the news. The rest is history. 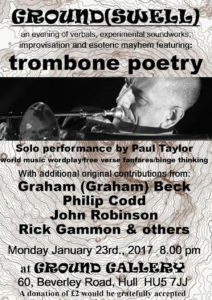 The first trombone poetry events in Hull happened in 2008, with two nights at the Humber Mouth Festival, one co-hosted by Hull Jazz. In 2010, Hull Truck Theatre staged an event for Larkin 25, where trombone poetry teamed up with The All What Jazz Band to perform commissioned pieces in commemoration of Philip Larkin. A poem later made it into the Larkin Society’s journal, About Larkin. In November 2014, Humber Mouth commissioned another trombone poetry event, Music & Musings. This was also in cahoots with Hull Jazz. In January 2017, trombone poetry teamed up with Hull artists for an evening of readings and noisings – Groundswell – at Ground Gallery and returned to the Hull Jazz fold for a performance of an original suite, Jazz in Hull: People & Places, dedicated to the memory of Ken Ford, founder of Hull Jazz, and inspired by the many musicians who were guilty of encouraging a young trombonist to try to play jazz. 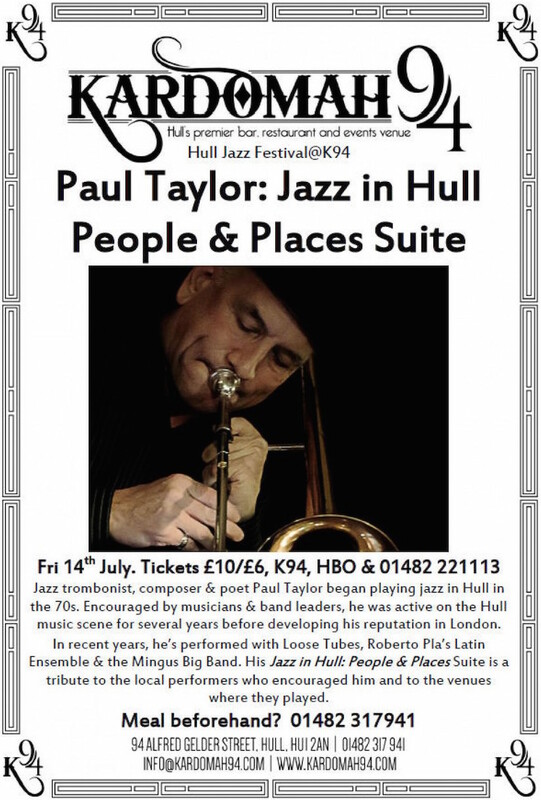 In July 2017, Jazz in Hull: People and Places was played at Kardomah94 for Hull Jazz Festival. 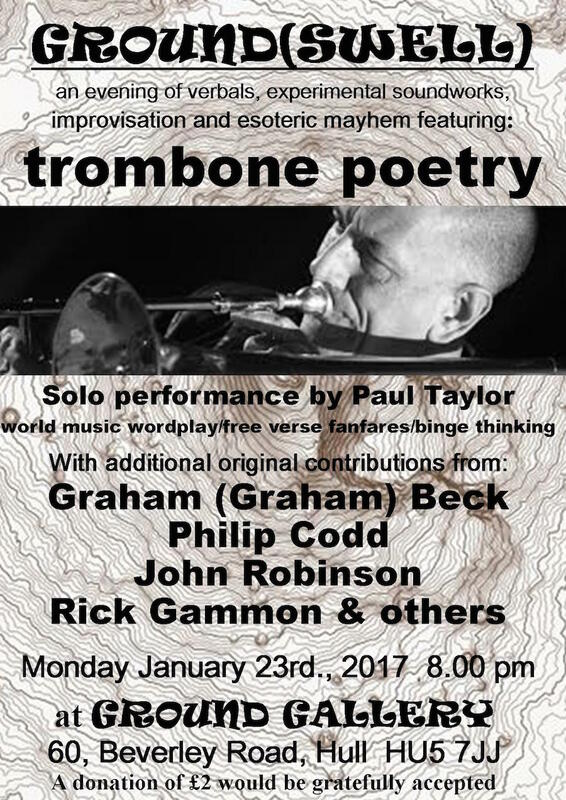 In November 2017, the first of three performances of Other Ranks, with words by John Robinson and music by me, was staged at Kardomah94. 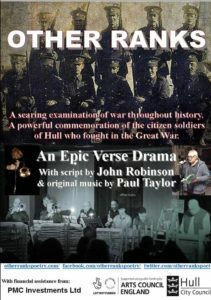 In November 2018, Other Ranks was unleashed at the Assembly Rooms in Barton upon Humber. This entry was posted in Trombonicle and tagged Hull, jazz. Bookmark the permalink.